Wines at the most expensive and prestigious end of the spectrum continue to grow in popularity. And prices, which have been climbing for years, show no signs of slowing down. But for all of the attention that the most sought-after wines get — their scores are parsed; their SRPs and performance at auction are analyzed — the economics of producing and distributing them are often overlooked. With this in mind, I spoke with some of the people responsible for a handful of the wines generally considered to reside near the top of the proverbial pyramid for insight into what goes into crafting, packaging, shipping and promoting them in the hopes of gaining a better understanding of what sets them apart, and what goes into determining their price beyond traditional market forces. “To make superior or premium wine you need to do everything from the vineyard to the bottling,” explained Rolando Herrera of Mi Sueño Winery in the Napa Valley. “There is a significant attention to detail, expense, time and risk required to make the best wine possible. “You need to start manicuring the vineyard and understanding the soil and micro climate. You need to find the best techniques to balance between canopy and fruit, and that sometimes requires extra labor passes to fine-tune those subtleties (fruit thinning, positioning, removal) that make a unique wine. “That’s just the vineyard. In the winemaking process, those grapes that you cared for so diligently in the vineyard are processed in the winery with much more care and gentleness. You spend more time on the winemaking side and pay more attention to the fermentation, pump over and skin contact” — all of which adds to labor costs and the amount of time required before the wines are sold and a return on the investment can be achieved. Then there is the issue of oak barrels. This can be a major expense. 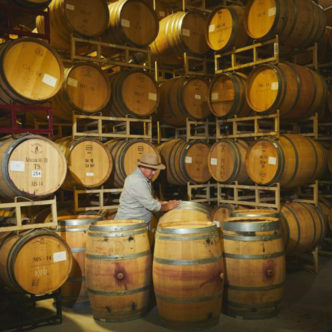 Right now, for example, French oak barrels from highly respected cooperage Seguin Moreau can clear $1,000 each, and American oak barrels from the excellent Napa-based cooperage Nadalié can climb north of $500. “Then there is the packaging that also needs to speak to the quality of the product, reflect the cost and represent a premium bottling,” Herrera said. For years, many producers bottled their top-of-the-line wines in heavy, cumbersome glass, often with a notably deep punt (the indentation at the bottom of the bottle) and a thickness that made a standard 750-ml bottle look and feel larger than its more traditional counterparts. That undoubtedly added to the final cost, not just from a supply standpoint but also from a transportation one: Heavier bottles cost more to ship. And while many producers still try to present their highest-end wines in more substantial bottles, with more striking labeling, many are working with glass manufacturers that have found ways to reduce the weight and amount of material required for these heftier bottles. The costs add up at every step of the process, forcing producers to consider how far they can go in passing them on to the end consumer, or in reducing them without sacrificing quality. Each producer’s understanding of its customer base is a key to longevity. “Maximizing profits is not sustainable,” Gamble said. “Superficial reading of the books suggests making only high-end wines with sustainable margins achieved by eliminating the middle man. Our highest-end wines are sold exclusively by allocation to our members and those visiting the winery. We do not charge what we think the market can bear. Of course, increasing prices are often perceived as an indication of a particular wine’s growing desirability. The reality is that the relationship between a wine’s cost and quality is often unreliable, but among the best of them, these super-premium wines represent the apex of what the land is capable of producing, and of the producer’s vision and work in crafting the wine. Often, that process is expensive.